Let Woody Allen take you back to the golden era of the radio days. Linking a number of colourful radio stories with a delightful look at his own childhood, the writer-director re-creates a lost era. Discover the Masked Avengers' horrible secert! See how a beautiful blonde cigarette girl (Mia Farrow) goes on to find stardom! And how burglars win the star prize on radio's 'Guess That Tune' for their unsuspecting victims. 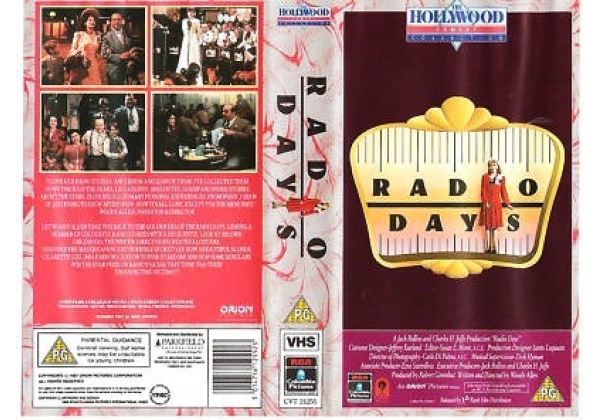 Or find "Radio Days" on VHS and DVD / BluRay at Amazon.